To get authentic results, I recommend using fresh ghee; my second choice would be a newcomer on the market – avocado oil. It can be heated to a very high temperature with out smoking, is very delicious, and one of the lowest of all unsaturated fats – actually helping to lower cholesterol in the blood. Olive oil would be the third choice. I like to use baby white or purple eggplants, but large eggplants can be cut into wedges and used as well. ghee or olive oil for frying. Combine the turmeric, salt and water in a bowl. Cut small eggplants in half, or cut larger ones into wedges roughly 2½ inches (6.5 cm) long and 1½ inches (4 cm) wide. Toss the eggplant with the turmeric-salt mixture and set aside for 15-30 minutes. 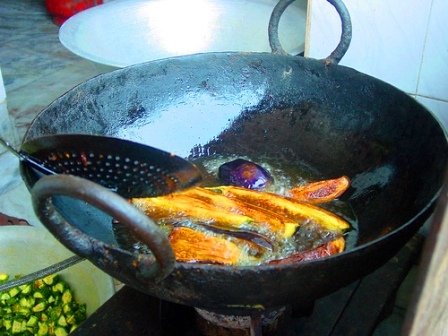 To remove the watery turmeric marinade, drain the eggplant in a paper towel-lined colander. Pour enough ghee or oil to reach a depth ½ inch (1.5 cm) in a large heavy frying pan and place it over moderately high heat. When it is hot and nearly reaches its smoking point, carefully add a single layer of eggplant pieces. Fry, turning the pieces on all sides, until they assume a rich reddish-brown color and are fork-tender.